The NITI Aayog has come up with a proposal to give relief to distressed farmers which, among other suggestions, is being considered by the government. The proposal will have a minimum impact on the exchequer and will be the least ‘market-distortionary’, say NITI Aayog officials. The area-based income compensation (ABIC) scheme says that farmers should be paid the difference between the actual price they get and the state-mandated minimum support price (MSP). The compensation, according to this model, will be determined on a per acre basis by using district-level estimates of marketable surplus and prices in the harvest season. The payout under this proposal will be different for each district and could be implemented easily as the price data is reported on a daily basis from over 3,000 mandis across the country in the government’s own agmarket.nic.in portal. The model could also be used to compensate for past losses as the agmarket portal has the arrival and the price data of the past months as well. The payment will not be applicable in those districts where government procurement for the public distribution system is in operation as the prices in such places will, in any case, be closer to the MSP. “This method of payment will take care of productivity variations as well as price variations across the mandis and will be the least market-distortionary,” a senior NITI Aayog official told Business Standard. In the other models of income transfer currently being talked about, whether it is the Rythu Bandhu of Telangana or the Krushak Assistance for Livelihood and Income Augmentation (Kalia) of Odisha, payment is paid on a per acre and per household basis, irrespective of the quantity of agriculture produce sold or produced by the farmers. Agriculture Minister Radha Mohan Singh, speaking at a Business Standard event, also said that the government was working out measures to directly transfer the MSP to farmers. All farmers will need to do is give their land and crop production details to the government through a special portal. In return, they will be compensated for the difference between the MSP and the actual market price on a per acre basis after the harvest is over. For example, the Aayog found that in Karnataka’s Belgaum district, if all the produce of the farmers was sold or procured at the MSP, the farmers would have received Rs 176 crore more than what they received at actual price in 2017-18. This amount, if given to farmers as income compensation for price loss, will come to around Rs 1,670 per acre per farmer. The payout will be applicable only for those crops for which the Centre declares the MSP. “Through this model, farmers can even be compensated for the losses suffered by them in the past and it will have the lowest financial burden on the central exchequer,” said another official involved in the discussions. The ABIC model will allow the free play of market forces and is not expected to affect exports as the compensation will be paid directly to farmers. Officials familiar with the proposal said there is also talk of providing crop insurance free to farmers at zero interest on timely repayment of short-term crop loans, as part of the relief package. At present, under the Pradhan Mantri Fasal Bima Yojana, the government charges an insurance premium of 2 per cent for all kharif crops, 1.5 per cent for rabi crops, and 5 per cent for horticulture. 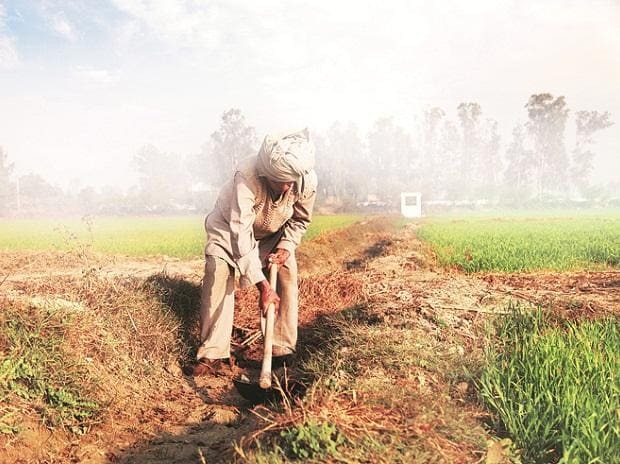 For interest subvention for short-term farm credit, the Centre spent around Rs 15,000 crore in 2018-19, which might go up to Rs 28,000 crore if the subvention is waived completely. At present, farmers get short-term farm loans of up to Rs 300,000 at a 7 per cent interest rate. An additional incentive of 3 per cent is being given to farmers for prompt repayment. The government has set a target to provide Rs 11-trillion credit to farmers in the current financial year. It extended Rs 11.69 trillion credit to farmers in the previous financial year, surpassing the target of Rs 10 trillion. The relief measures are being considered after the Bharatiya Janata Party lost power to the Congress in the three heartland states of Madhya Pradesh, Rajasthan, and Chhattisgarh in the recent state polls, largely owing to agrarian distress.